Сделал прямо возле входа в лагерь, не сходя с места. Просто бегал в зоне выполнения квеста - юзал радужную световую ловушку собирая сферы и убивая паралельно мобов. Кв засчитан.Удачи! Just use Multi-spectrum Light-trap at the 67,43. Small lights are flying in the air,you need to place light trap under it. Very easy quest. You can basically just enter the base at Razaan's Landing, find a safe spot and just "spam" the quest item over and over again until you have 15. 64,46 works well for this. It's out of the aggro radius of any of the ethereal guys (at least as a lvl 67), and the big pink entrance thingy keeps spawning the balls. You can basically get them as fast as the item recharges, without any aggro. Very good place to get them. Thank you. I found a easy way to do the quest go at 65.5 43.2 and catch all the "little fantastic" I think that the device that is already there is the reason for so many balls gather there. Clear the immediate area (at most I killed about 3 where i was). Put the quest item on a spare action bar (somewhere where you can see it). Just stand by one and keep dropping on that one you dont have to go to each and every one. "L'Allegro", lines 33-34: "Com, and trip it as ye go / On the light fantastick toe". John Milton's poem :) Might reffer to "The Ligth Fantastic" by Terry Pratchett too. Indeed, 64,46 is the best place. Being level 70 with flying mount or a druid with Flight Form makes 65,43 on the cliffs a very good and safe place. I could rapidly just place the trap and get an orb. Very easy to do, the Multi-Spectrum Light Trap has almost no cooldown, just try to skip most guys you can. 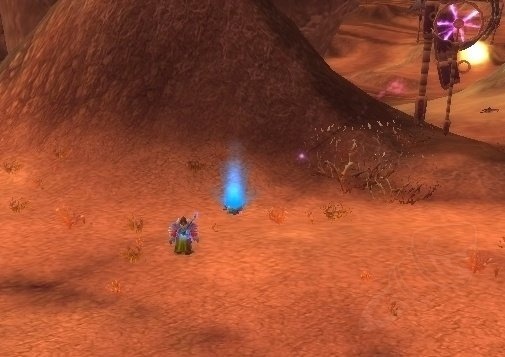 Btw, you can kill the Fiendling Flesh Beast for this (http://www.wowhead.com/?quest=10671) quest. The only thing I did was to run around randomly while having 5 mobs chasing me and planting trap all over the place. Sure enough I got the quest completed! Very easy or very lucky! I found that if you climb up onto one of the thorn branches near the camp you can just lay traps there and nothing can get to you. The problem is getting rid of the agro, because they will agro you if they walk under you while trapping. The little pink balls are tiny look like part of the environment in Razaan's Landing. Once you locate them you can drop your trap under them and at least one should zip on over to your trap. Rinse and Repeat until complete. I was hoping to post that all these comments and locations saved me, but i cant say that! Got all the way to 8/15 and it quit. Tried relogging, turning off addons, sending pet away, going to all the locations listed but still nothing! The light speck goes to the box, the box closes then just evaporates! So, after an hour, going to do something else before it drives me nuts! This has to be one of the dumbest quests I have contracted to this point. Fly or walk to 68.04 45.80, right in front of the 2 entrances to Razaan's Landing. Just stand there and wait for the excitement. The little white ping-pong ball with pink cloud will start rolling at you. just clik the quest icon as they approach. The challenge is to get more than 1 at a time, because it is pretty boring getting to 15, that's about it. If you go to 65.43 you will not have to move once you get ride of the mob it will take only minutes to get all 15. Don't be confused by the giant yellow balls of light that leave the ethereals when you kill them. These are not the balls of light you are trying to trap. See the other comments about the tiny pink balls of light. Поймайте 15 световых сфер братства Разаани при помощи световой ловушки. Эфириалы – Разаани – экспериментировали с одной интересной технологией в лагере Разаана, что на севере отсюда. Я уверен, что они не будут против, если вы поставите эту ловушку, чтобы поймать несколько образцов их розовых летучих световых шариков? Они все равно наверняка только для украшения. У ловушки есть специальное свойство – когда она открыта, она она притягивает к себе эти летучие шарики. Конечно, это может всполошить астральных духов и привлечь их к вам. Как понимаю, после нашего разговора вы наловили световых шариков в лагере Разаана? Интересно будет посмотреть на них и понять, что на уме у духов Астрала. Эй! Да подожди ты минутку!! !